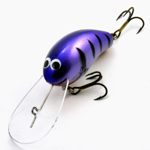 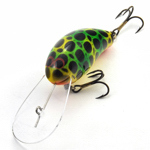 The Oar-Gee Lures Pee-Wee from Tiger Lures, is a round bodied lure, ideal for casting and trolling. 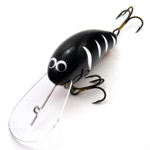 An excellent casting lure, as the weight is in the body and not in a thick moulded bib which tends to enter the water first and causes the line to tangle up in the trebles. 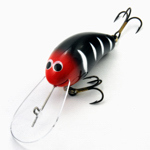 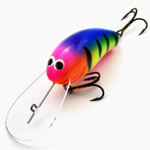 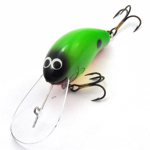 The weight is 13 grams and comes standard with VMC 9632BZ size 4 trebles and 3H split rings. 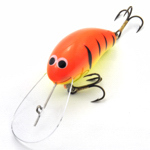 The action is wide and vibrant with a noisy rattle; construction is ultrasonically welded ABS plastic with integrated towing wire. 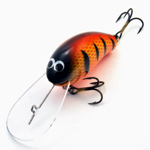 Capable of reaching depths of 4.5mts on the troll, and slightly less when casting and retrieving. 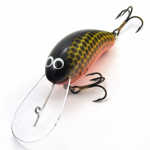 It is also a very good lure for casting snaggy water, with its large bib getting the lure down quickly it also offers protection for the hooks, while positive buoyancy gives it excellent back up capabilities. 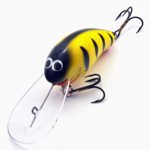 A loop knot is the preferred method of attaching lure to line or a small clip without the swivel.